The Orbis Ring Flash is designed to affix onto the front of a common shoe-mount flash and is suspended around the circumference of a lens. The Orbis does not produce light independently, rather it is a light modification device that produces an effect similar to studio ring flashes usually costing ten times the price of the Orbis. A ring flash is one of the best ways to light for a still-life, portrait, or macro shoot. Its effect is unmistakable and very distinct. As a flash attachment, the Orbis requires a shoe mount flash and a PC cord, off-camera cord, or wireless flash trigger. Lens port diameter is 86mm so most SLR lenses are compatible. Orbis must be hand-held. Designed for portability, the Orbis packs neatly into a camera bag and is a fraction of the bulk and weight of a traditional studio ring flash and power supply. As of this writing, the Orbis Ring Flash has been tested with the following: Canon 300TL, 420EX, 430EX, 540EZ, 550EX, 580EX I and II, Nikon SB28, SB600, SB800, SB900, Cosmos 360, Vivitar 283, Olympus FL36R, FL50, Sunpak PF30X and 5000, Sony F56, Minolta 5200 and Sigma 500, Metz 48 and Metz 58 and Pentax AF540. See manufacturer's website for up-to-date list. Box Dimensions (LxWxH) 11.1 x 9.5 x 2.7"
Orbis Ring Flash Diffusing Attachment is rated 4.1 out of 5 by 55. Rated 5 out of 5 by Have Booth Will Travel from Great fill light for strobist shooters As a strobist style, small-flash shooter I was looking for a consistent and reliable ring flash. I had rented Profoto gear in the past and was able to acheive ring-flash lighting with the Profoto Ringflash, but my day-to-day shooting is with 1-3 Canon 580EX II flashes. The Orbis ring flash is a wonderful option for it's build quality, it's fair price, and most importantly: it's amazing idea. It's not a FLASH, but an accessory TO A flash. The mirrors inside spread the light perfectly around the circle giving the even fill I'm looking for. When used the way I like (powered down low and not as a primary light) it adds a beautiful fill that people will be wowed by. Rated 3 out of 5 by Roger C. from Nice Light but Clumsy The ring flash creates nice consistent light for portraits especially when close to the subject. The way a flash fits into the housing is not very stable. The flash is loose and Orbis with flash is difficult to hold onto. You have to remove the hood on the lens. The Orbis, flash and camera all become very clumsy. Forget manual focus. You'd need a third hand. The light is great but the price is much too high for something that is so difficult to handle. It needs to be redesigned as far as actually inserting the flash and handling the device. The Orbis TM Arm helps (expensive as well) but you still need to work to maintain balance and still be able operate the camera. Rated 4 out of 5 by JGSIII from Does what it is suppose to do.... Orbis ring flash adapter brings a lower cost alternative to ring flash photography and if you've never exposed images this way, you're in for a treat. Remember those SNL still images portraits at commercial break? The look of a ring flash is distinctive and gives photographers an interesting alternative to bounce and direct flash. The Orbis is not particularly secure and feels awkward at first, but with logistics in mind, it delivers a really cool look - especially if the subject is directly against a wall or backdrop. Don't bother with ETTL cords - (manual off-camera cords work fine)as you want to blow-out the face of your subject to achieve a high-key look. The price may seem steep for an adapter, but the final outcome is worth it. Rated 5 out of 5 by fivekatz from FANTASTIC RESULTS W/GOOD FLASH I original got the Orbis for macro photography but quickly found that it is also fantastic for portraits. The device is simple enough, fitting over your existing flash. I shoot Olympus E-30 and use the FL-50 flash. You will still have full TTL with similar gear. The results are outstanding, avoiding the white balance issues LED rings cause and because I already owned the flash, at a real savings over dedicated units that are meant for macro and certainly less than a studio ring light. The product is a bit bulky to handle whether it is hand held or you use the bracket accessory. It makes running and gunning a little more awkward but IMO the results the product produces and the price point make it worth it. Rated 4 out of 5 by Rocktog from Versatile but clumsy This does just as described. It is great for portraits as fill as well as photojournalism. It's a it clumsy and the flash on the arm bracket and the ring don't feel secure. I added an elastic strp around the speed light and the arm to make it mo secure. I don't like the giant branding on the back, so I covered it with my own branding. The bracket arm is a must. Even if you plan to just handhold the unit (if you want to only use for a few shots) it helps keep the unit together on the speed light. It performs better than the Ray Flash. I prefer using a Black Rapids R-Strap camera strap, which attaches to the bottom of the camera at the tripod mount, and it's a drag to switch out my camera strap, but I deal with it. Rated 4 out of 5 by Mark from Nice Flash Modifier. I haven't completely nailed this thing, but once I get exposures dialed in (I don't think it works great on TTL unless you add some exposure compensation), it'll be a good addition to my lighting toolbox. I've rented studio ring lights and beauty dishes and have had better results than I have with this so far, but again, need to spend more time with it. My Vivitar flash doesn't feel too secure in it so I added a small piece of velcro which has help a lot. I bought the Vivitar to pretty much have it just dedicated to this modifier so I could probably velcro it in even more, but I think the small piece will keep it from any accidental drop outs. Rated 4 out of 5 by lesdmd from Clumsy but Efficient Produces a beautiful defused shadowless light with a very distinctive ring flash look that you will either like or not-so-much. Works well on or off camera and as a fill, macro, as well as primary flash. Fits tightly on large (SB 900) flash, is very loose on smaller units (SB600) - - - so loose and heavy that it will tip this flash forward and fall off even when on mounting bracket and positioned over lens. Can be hand held, but quickly gets heavy and clusmy. I did my research, and there were no surprises. I certainly recommend the product despite the negatives. It would be virtually impossible to produce the results without making a much more substantial monetary investment. Rated 3 out of 5 by john from Works well Out of the box it casts a good light & does as advertised consistently. Many opportunities to do creative lighting without fussing over exposures & lights. Much too floppy making it difficult to handle w/SB900). Overly branded.Definitely needs redesigning. Love the quality of light. Used as rim light in TTL mode last evening = great exposure. Now experimenting w/ Hollywood style contrasty B&Ws. Make sure this top heavy device is secured at ALL TIMES and at all levels! Can you tell me if this product will fit the Sigma EF-610 DG Super? Will it fit well with a Canon t5i? And what type of flash will be best to use with? 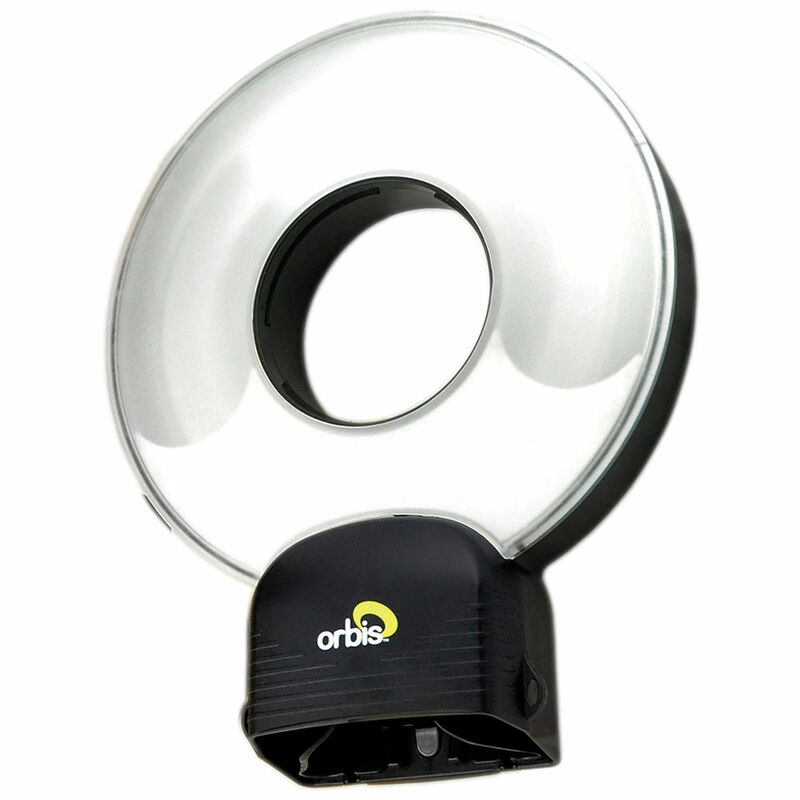 The Orbis ring flash will accommodate pretty much any speedlight of medium or large size, including a Lumopro LP180 or Canon 550EX. The fit is not glove tight , but is adequate for most needs. A bit of gaffer tape may help to improve fitment, with the flash head adjusted to the vertical position. Large and bulky, it will probably work best off-camera, using a 3' or 6' coiled TTL remote cord, or other remote trigger. It will work fine with the Canon t5i, or any other camera, just not attached to an on-camera flash.